Brown & Sharpe CMM, 18" x 20" x 16"
We have an experienced quality assurance staff on site, supporting every process on the way to the finished product. As we aggressively pursue ISO 9001:2008 compliance, our continuous and process improvement programs fine-tune our already strict quality-assurance procedures. 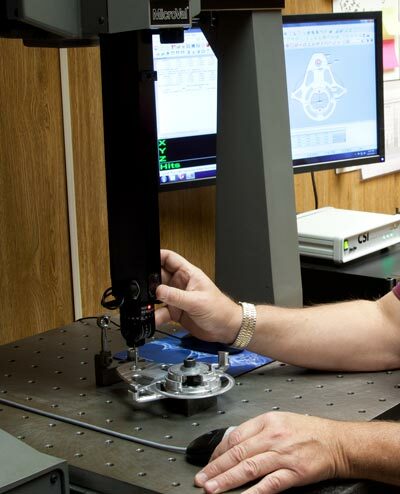 Our Brown & Sharpe CMM accurately measures dimensions of a part that are impossible to measure by hand, and up-to-date software allows us to compare measurements directly to the solid model. 1	Brown & Sharpe CMM 18" x 20" x 16"
Dial Bore Gauges to 12 1/2"
Thread and Plug Gauges to 3 1/2"
Numerous Gauge Blocks, Pins, etc.